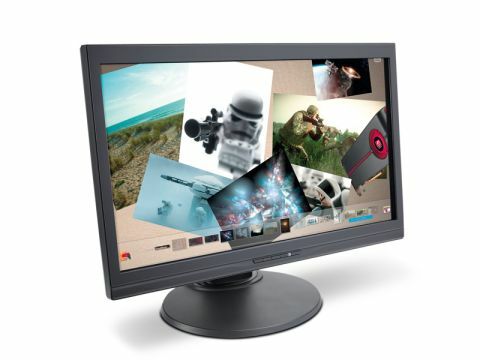 A touchscreen monitor with Full-HD resolution. But do you need it on a desktop? It's fast, responsive and has a quality panel. But is a touchscreen necessary on the desktop? When Microsoft was first touting Windows 7, much was made about the operating system's touchscreen capabilities. The problem remains that few of us have, or have any interest in, touchscreen displays. Most of this current malaise comes from the fact that a decent size touchscreen monitor generally costs a small fortune. Stepping in with optical technology to avoid the need for pricey reactive screens comes Albatron. At its most basic, the optical technology employed by Albatron's Optical Touch Monitor is designed so it adds only a small premium onto the manufacturing costs of a standard flatscreen display. It uses a combination of infrared light, optical sensors and reflective bars embedded in the fairly substantial bezel around the outside of the screen to track your fingers on the display. Traditionally, the barrier to large multi-touch displays has been the proportional cost of creating large expanses of sensitive material. With the only expense being the sensors surrounding the screen, there's little extra cost to ramping up the scale. Indeed, Albatron has also got a 42-inch version going. I first saw the technology at Nvidia's Nvision conference last year and again at this year's Computex, and only now is it actually making an appearance. This display is currently available in Taiwan, but should be hitting the western world soon, either via Albatron or HP Compaq in the guise of the L2105tm. The best thing is: it works. We picked up the soon-to-be released Touch Pack for Windows 7 from our friends at Microsoft, which contains some interesting multi-touch applications, such as Surface Collage and Surface Globe. These show off Windows 7's touchy-feely capabilities, as well as the performance of the Albatron OTM. Suddenly it's responsive and tactile, which is all you can really ask. Before installing the pack, it was tough to really get a feeling for the screen. General Windows icons and navigation buttons are simply too small to cope with my fat fingers, and only Internet Explorer had any touchscreen gimmicks to show off. But this is almost all that a standard desktop multi-touch monitor is: a gimmick. Trying to use a touchscreen panel on your desk is just asking for a new kind of RSI. It's utterly counter-intuitive stretching out across your keyboard to tap a tiny icon a few times to get it to register. So what's the usage model? We can see the value in all-in-one machines, and maybe if you're hiding the mouse and keyboard of a PC you've stuck in your kitchen, but on the desktop it's a waste. That said, Albatron's optical tech means that the cost of picking up a multi-touch monitor isn't actually much more than a standard screen. So doesn't it make sense to go for the one with the wider feature set? It's a valid argument, and the quality of the screen almost makes it ring true. Unfortunately, the idea of having such a highly reflective screen for gaming is inadvisable. Hit a dark area of a map and you'll find you're just looking yourself in the eye while you die. Still, it's a great, low-cost implementation of futuristic technology, though still only a gimmick for now.